Speed is crucial in any athletic endeavor. Puma, the German sports brand, is well aware of this. Speed wins—not only on the field, but also in distribution. For a time, however, Puma North America faced a speed challenge of its own. Years of steady retail growth coupled with surging e-commerce volume left it struggling to keep pace with order fulfillment demands. A recent consolidation of its distribution operations and the addition of new software and related technology changed all that. With its mojo back, Puma is now running well ahead of the pack. AutoStore provides high-density storage using stacked bins arrayed in a grid. Robots ride on rails along the tops of the stacks, retrieving bins as needed for delivery to goods-to-person fulfillment stations. As a leading provider of footwear, sports apparel, and golf equipment through its Puma and Cobra Puma Golf brands, Puma records about $5 billion in annual sales, about $1.75 billion of which comes from the Americas. Up until a few years ago, it served customers in the U.S. from three distribution centers: one in Torrance, Calif., that distributed footwear, another in nearby Carson that handled apparel, and a contract facility in Ohio that filled e-commerce orders. We should also note that Puma distributes through retail and wholesale channels as well. While this arrangement worked for a time, it also had some drawbacks. For instance, there were occasions when an e-commerce customer would receive three separate shipments for one order. The setup also required a lot of labor and overhead to staff three facilities. Another issue was that, as a result of rising e-commerce volumes, the company was fast outgrowing the network's fulfillment capabilities. The crunch was especially pronounced during the December holiday season, when Puma does 20 percent of its annual e-com business. "Our e-commerce channel was growing so fast that we wanted to take it in-house," says Nicole Barrasso, senior director, strategic supply chain initiatives. She notes that e-commerce is a very different animal from the company's other channels. "Instead of 10 orders of 1,000, it means distributing 1,000 orders of one," she says. In 2016, the company decided to consolidate all of its distribution operations at the Torrance DC. As it happened, the tenant in the other half of the facility was not renewing its lease, which allowed Puma to take over the entire 670,000-square-foot building. Acquiring that space opened up all kinds of possibilities for Puma and the third party it contracted to run the facility—Brookvale International, a division of California Cartage Co. Among other things, Brookvale would be able to bring distribution for Puma's footwear, apparel, and accessories under one roof, while serving all three channels—e-commerce, retail, and wholesale—from a shared inventory. To equip the building, Puma turned to systems integrator Bastian Solutions. Puma had worked with Bastian in the past and was confident the supplier would be able to provide solid solutions to fit its needs. 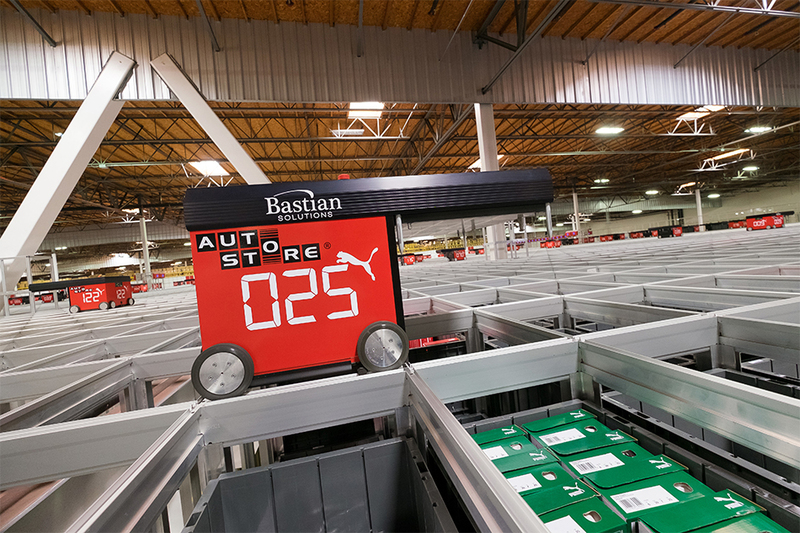 Bastian actually proposed four automation designs, with Puma choosing one centered on the AutoStore automated storage and picking system. The AutoStore technology hails from Norway but has had a number of successful installations in the U.S. It provides high-density storage using stacked bins arrayed in a grid. Robots ride on rails along the tops of the stacks, retrieving bins as needed for delivery to goods-to-person fulfillment stations. Puma's AutoStore occupies only 50,000 square feet (115,000 square feet, if you include inbound and outbound conveyors). Despite that small footprint, the AutoStore system can hold 4 million products, including half a million shoes. Products are housed in 171,000 bins that are stacked 16 high, with 170 robots to service them. Puma can fit all of its sports accessories, apparel, and golf accessories, as well as shoes for e-commerce orders, into the AutoStore, according to Barrasso. And the benefits don't stop there. "We have experienced labor savings, and it has changed our e-commerce throughput overnight," she reports. As orders are received, the warehouse management system (WMS) communicates with the warehouse control system (WCS). The WCS then determines whether they should be diverted to reserve storage or directly to the AutoStore system. 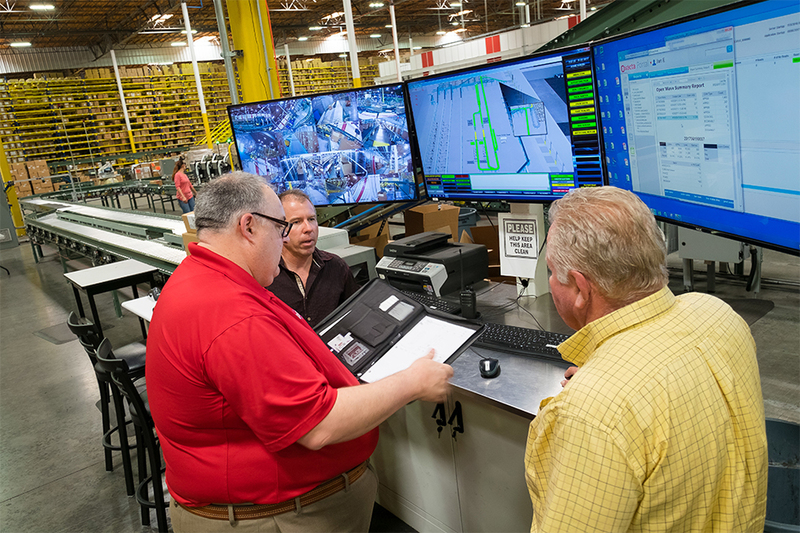 In order to realize the automated system's full potential, Puma also upgraded the facility's warehouse management system (WMS) at the time of the expansion. 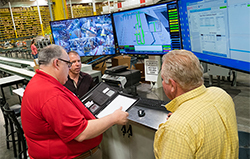 Puma and Bastian worked with software developer Manhattan Associates Inc. for the upgrade, which ties directly into Bastian's "exacta" brand warehouse control system (WCS), which coordinates the material handling systems. Because of the facility's location in California, the AutoStore was engineered to meet strict seismic requirements. "If there is an earthquake, the best place to sit is inside the AutoStore. We put a lot into that planning," Barrasso says. "We had great partners working with Bastian and Manhattan for the systems. It all worked as planned, so now we are just trying to make it even better and faster." Operations in the facility begin in receiving, where cartons of inbound items are loaded onto conveyors and scanned. Based on those scans, the WCS determines whether they should be diverted to the left for the reserve storage area or right to the AutoStore system. Most of the shoes and larger items, as well as products not immediately needed for the AutoStore, are sent to reserve storage, where up to 1.5 million units are stored in racks. 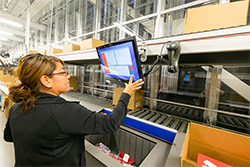 Whether they arrive directly from receiving or as replenishments from the reserve racks, products entering the AutoStore are assigned to one of six inbound stations for induction into the system. An associate opens the cartons and scans the items. The scan initiates the delivery of AutoStore bins to the station. Most of the bins hold a single stock-keeping unit (SKU), though 20,000 of the bins have storage slots separated by dividers to accommodate multiple SKUs. A display screen provides directions to workers on which products go where in the container. Once a bin is complete, it is automatically returned to the AutoStore. In all, about 30,000 different SKUs reside in the system. Picking stations are located in the middle of the AutoStore's gridwork to minimize the robots' travel time. As orders arrive for the day's processing, the WMS sends them to the WCS that manages order fulfillment activities. The WCS batches the orders into waves to optimize the fulfillment process. "One of the greatest gains we got was being able to send multiple waves throughout the day," Barrasso says. She adds that the AutoStore's ability to continuously reshuffle the bins within the stacks allows the system to prepare for picking future waves in addition to processing the current wave. For example, the system can work overnight to rearrange the bins' positions within the stacks to speed up retrieval operations the next morning. In addition, the software can build mini-waves throughout the day. The system's robots gather bins holding products for the current wave for delivery to 16 picking stations. The stations are located in the middle of the AutoStore's gridwork to minimize the robots' travel time. A single bin is presented at a station at a time to reduce the chances of a mis-pick. The design also assures the security of products in the AutoStore. "No one is getting anything out of there unless they are picking," Barrasso notes. A display screen at the station shows the worker a picture of the item (or items) to be selected, along with the quantity to pick. For bins with multiple storage slots, a light above the station illuminates the bin's interior and a graphic on the screen indicates which slot contains the required product. As a result of all these failsafe features, picking accuracy is so high that the facility no longer bothers to send orders for quality checks. Four totes or cartons representing orders are staged adjacent to the source bin for gathering the needed items. Six-slotted totes are mainly used for e-commerce orders, while cartons are used for retail and wholesale orders. The cartons arrive from two automated carton erectors that build boxes in six primary sizes. Lights and quantity displays at each tote or carton indicate how many items should go into each order container. The picking process then continues until the container is full or the order is complete, at which time it is pushed off onto a take-away conveyor. Retail store orders exit the system via a Bastian ZiPline conveyor that transports many of the cartons to value-added stations. Here, workers perform various services to make the products retail-friendly, such as ticketing or refolding garments for display. The orders next join up with the cartons that bypassed the stations to pass though auto-taping and labeling machines before heading to shipping. There, the cartons are floor-loaded onto outbound trucks. E-commerce orders are sent to processing stations where workers remove the items, scan each one, and place them on a belt for transport to an auto-bagging system. The bagging systems can process 360 bags per hour per station. The bags are then conveyed to shipping, where pop-up wheels within the conveyors divert them to one of five lanes based on carrier assignment. As for how the new setup has been working out, Puma executives have high praise for the automated equipment. 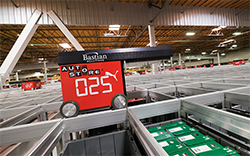 The AutoStore system has helped Puma achieve double-digit savings on staffing costs, which is important in Torrance's tight job market, according to Barrasso. "The supply of workers just is not there to meet the demand. But the AutoStore is simple to use, and it is very easy to train new people on it. We can get them working in minutes so that they can hit the ground running," she says. Barrasso adds that being in one building also makes it easier to move associates wherever they're needed within any of the operations. Typically, the building runs two shifts, but it can ramp up to three during peak periods. Speed and productivity are also on the rise because the AutoStore can process 200 lines per operator per hour. During the recent holiday crunch, 97 percent of e-commerce orders shipped within 24 hours, Barrasso reports. "We can process 24,000 e-commerce orders a day now," she says. "Before, we could only handle about 6,000." Watch a video about the system and see it in action below. Feedback: What did you think of this article? We'd like to hear from you. DC VELOCITY is committed to accuracy and clarity in the delivery of important and useful logistics and supply chain news and information. If you find anything in DC VELOCITY you feel is inaccurate or warrants further explanation, please ?Subject=Feedback - : Off and running">contact Chief Editor David Maloney. All comments are eligible for publication in the letters section of DC VELOCITY magazine. Please include you name and the name of the company or organization your work for.